From 17 to 29 November 2018, UNU-IAS experts and staff participated in the UN Biodiversity Conference held this year in Sharm El Sheikh, Egypt, consisting of the Fourteenth Conference of the Parties to the Convention on Biological Diversity (CBD COP 14) and a number of related conferences, meetings, and events. The conference highlighted UNU-IAS work related to the International Satoyama Initiative (ISI) project. UNU-IAS organized two side events in collaboration with partners: “Socio-Ecological Production Landscapes and Seascapes for Biodiversity and Livelihood: Roles in Post-2020 Global Biodiversity Framework” on 17 November, featuring a keynote address by Prof. Kazuhiko Takeuchi; and “Consolidation and Replication of Effective Landscape Approaches for Biodiversity Conservation and Human Livelihoods” on 19 November. 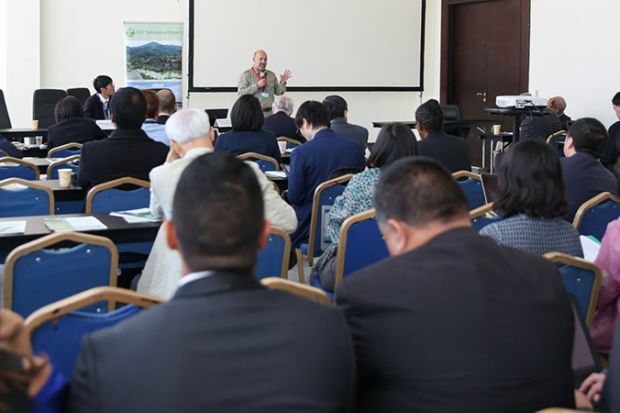 Both events focused on different aspects of the work of the ISI project, particularly its contributions to CBD policymaking through the International Partnership for the Satoyama Initiative (IPSI). UNU-IAS staff also contributed as presenters and panelists at: “The Nature and Culture Summit: Biological and Cultural Diversity for Biodiversity and Human Resilience Achieving the Sustainable Development Goals and the Paris Agreement”, related to UNU-IAS ongoing work with the UNESCO-CBD Joint Programme on Linking Biological and Cultural Diversity and following up on the 2016 1st Asian Conference on Biocultural Diversity organized in part by UNU-IAS Operating Unit Ishikawa/Kanazawa (OUIK); the 6th Global Biodiversity Summit of Local and Subnational Governments: Mainstreaming Biodiversity for Urban and Regional Development; and the Rio Conventions Pavilion day on “Agriculture and Biodiversity: walking hand-in-hand toward a sustainable world”. As the CBD looks toward the end of the UN Decade on Biodiversity 2011-2020, UNU-IAS continues to contribute actively to the policymaking process and the achievement of the Strategic Plan for Biodiversity 2011-2020 and its Aichi Biodiversity Targets. UNU-IAS staff participation in the UN Biodiversity Conference 2018 also served as an opportunity to take part in preparatory processes to develop the Post-2020 Biodiversity Framework.